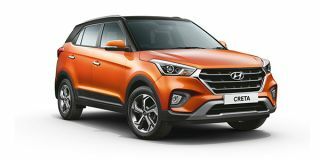 Hyundai Creta price in Mumbai starts from Rs. 9.60 lakh (Ex-showroom). Creta is available in only 15 variant. Hyundai Creta's top competitors are Tata Harrier (price starting at Rs. 12.70 lakh in Mumbai) and Maruti Vitara Brezza (price starting at Rs. 7.78 lakh in Mumbai). Share your experiences with Creta? Q. Is it the best SUV in India under 20 lakhs. I am looking to buy the basic petrol variant, is it better than Creta in terms of ease of driving and interiors? Q. Sports Plus is good for average and maintenance and also Jeep is good or Creta? Q. Which petrol variant is best? and what is the price on road. Q. Is it value for money as compares to Duster. Q. Is Creta maintenance cost high?